When it was released, this book seemed to cause quite a stir and wherever the cover appeared, a deluge of praise wasn’t too far behind. And so it was with high expectations that I finally started reading The Name of the Star on the plane to America. It was with high expectations that I read through the first few chapters and the first gory appearance of an apparent victim of Jack the Ripper. As the chapters went by, those expectations held until I realised that I was about half way through and was still expecting something great, rather than reading something great. Fortunately, scattered throughout Rory’s boarding school trials and tribulations are some pretty gory murders. Johnson does a tremendous job of describing a London gripped by fear and confusion and I particularly liked how she highlighted the role of the media frenzy in creating and sustaining hysteria. There are occasionally very small chapters told from the perspective of a relevant expert (an expert in the history of Jack the Ripper and the woman that designed the CCTV system that fails to catch the current killer etc.) and I wish that there had been more of them. 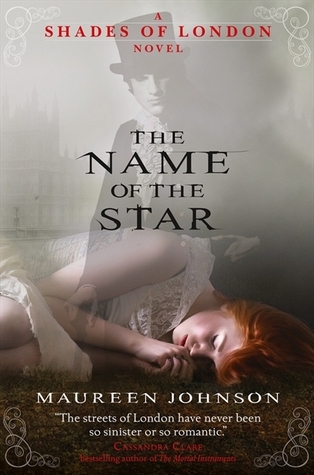 For better or worse, there is something morbidly fascinating about the Victorian menace and I would have enjoyed The Name of the Star if more had been made of the historical aspects that were often mentioned in passing. Much though I don’t relish descriptions of disembowelments, it was a shame when the tense atmosphere was shattered. I won’t say too much more (because it’s really hard to without getting spoiler-y) but ultimately I came away feeling disappointed that such a superb idea eventually became quite generic, lacklustre romantic sub-plot and all: A serial killer seemingly mimicking Jack the Ripper is on the loose: what do you do? Why, break out of the apparently safe building that you’re in and sneak around in the dark to see a boy that you barely know, of course! REALLY, RORY?! Really. Overall: Sort of recommended to the older end of the YA market – I don’t doubt that I would have loved this when I was a teenager and going through a Point Horror phase and eagerly awaited the next instalment, The Madness Underneath, set for release in March 2013. As it is, I probably won’t be seeking it out because I’m not hugely fond of the direction that the series looks to be going in but if someone could let me know how things pan out, that’d be swell.